FOTA Hill Day in Tallahassee, FL, January 22 at the Capitol Building, 2nd Floor Rotunda at 8am. We were joined by our lobbying firm, Corcoran & Johnston (C&J), to establish a presence with legislators in the rotunda, promote an awareness OT on the hill, as well as engage in sit-down meetings individually with specifically selected legislators at their offices as arranged C&J. Our objective was to raise awareness of the distinct value of OT in serving Floridians, and addressing specific issues of access to care, protection and promotion of OT practice across our state. We hope many OTs join us for Hill Day in the years to come. Part of your membership dues go to ensure that FOTA as skilled advisement from our lobbying firm on strategies to promote and protect OT in Florida. FOTA relies on membership support to advocate successfully. More members are needed to increase our ability to influence change. Thanks to OT Students from FAMU and OTA Students from Keiser U provided a positive presence and enthusiastic representation for the future of Occupational Therapy in Florida. Students and faculty attended some meeting with legislators, toured the House and Senate Chambers, and mingled with the leaders coming and going in the Rotunda. A student poster presenting research on the important issue pain management through OT was presented near our FOTA tables. Informational Brochures were available for all passers by. The FOTA Governmental Affairs Co-Chairs, President, our Lobby Firm--Corcoran & Johnston, and Members had 16 different legislators and their staff over the course of a full-day schedule. We discussed issues important to the practice of OT and the service to our clients over several talking points including the Opioid Crisis, Pain Management, Mental Health in Schools, Medicaid, and Telehealth Practice. Our meeting included leaders on important health policy, and human services committees. We thank them for a receptive discussion about OT in FL. I have included some pics of my hand-held schedule and talking points from the day of meetings. Join the FOTA leadership and membership in acknowledging National Children's Mental Health Day, May 10th, 2018. 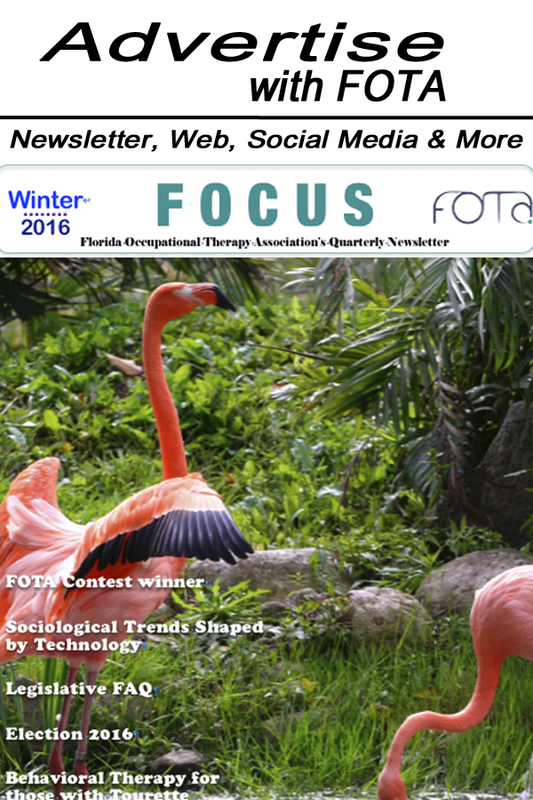 In service of our FOTA vision to be the respected authority on occupational therapy’s contribution to health and well-being in Florida, we have assembled a humble offering of clinician's resources and supportive information for OTs from across the state to use in service to children's mental health. Our Ad Hoc Committee on School Mental Health is developing further programming to offer to our members in the future, and we are developing policy statements to share with our advocacy team and our Florida legislators. FOTA believes in the potential for OT practitioners to impact child well being and provide new and innovative programs to meet the needs of our students in schools across Florida. We believe in the preventative model, nurturing social and emotional learning, and skills for emotional regulation, social skills, and collaborative learning -- all through occupation-based activities. Please take time today, and everyday to nurture the wellness of children in your life and in your practice. See our resources below --an assemblage that is still a work in development. Take Care! Hello FOTA Members! And welcome visitors to the blog, we hope you join us in FOTA, as an OT You Belong! Happy 2018! As we say goodbye to 2017, we can all take account of the highlights, rewards, and challenges of the past year and move forward looking to improve. At FOTA, our commitment is to support you as a member in practice, education, and advocacy in this new year. The FOTA board is working together on developing future leaders in our organization through our Ad Hoc committee on Leadership Development. After last fall’s success with our OTA Leadership course, we plan to offer a continuing education course to select future leaders this spring. Our commitment is to foster and support leadership in FOTA for our success in the future. Your opportunity to be involved includes volunteering for an event, project, or committee, and serving on the FOTA board. The FOTA Elections 2018 will take place in March, where nominations for President-elect and Secretary will open on the website January 22nd.